244 Beacon is located on the north side of Beacon, between Dartmouth and Exeter, with 242 Beacon to the east and 246 Beacon to the west. 244 Beacon was designed by Sturgis and Brigham, architects, and built in 1882-1883 by David Connery & Co., builders, and John Morrison, carpenter, as the home of Thomas Dennie Boardman and his wife, Anna (Annie) Fearing (Leeds) Boardman. He is shown as the owner on the original building permit application, dated October 2, 1882. The Boardmans had built 242 Beacon, next door, in 1880 and lived there until 244 Beacon was completed, after which they made it their home. They also maintained a home in Manchester. T. Dennie Boardman was a leather merchant in his father’s firm until the late 1880s, when became a real estate dealer. He purchased the land for 244 Beacon on September 20, 1882, from Miss Alida Livingston Borland, who had purchased it from attorney Francis E. Parker on January 20, 1881. The lot had been assembled from portions of two parcels originally purchased from the Boston and Roxbury Mill Corporation on October 20, 1863, one by William Gardiner Prescott and the other by Francis Cabot Lowell, Jr., trustee under the will of his brother, attorney Edward Jackson Lowell. Click here for an index to the deeds for 244 Beacon. As built, the front (southern) half of 244 Beacon extended the full width of the lot, but the western wall of the rear half was set back from the property line by three feet, allowing windows facing west on the northern half of the building. When 246 Beacon was built in 1887-1888, the northern half of its eastern wall was recessed by a similar amount, creating an open area between the two houses. On July 13, 1886, T. Dennie Boardman transferred 244 Beacon into his wife’s name. During the 1887-1888 winter season, the Boardmans were living elsewhere and 244 Beacon was the home of Robert Chamblet Hooper and his wife, Helen Angier (Ames) Hooper. They had married in June of 1887 and 244 Beacon probably was their first home together. By 1888-1889 season, the Hoopers had moved to 183 Commonwealth and 244 Beacon was once again the Boardmans’ home. The Boardmans continued to live at 244 Beacon in 1897. 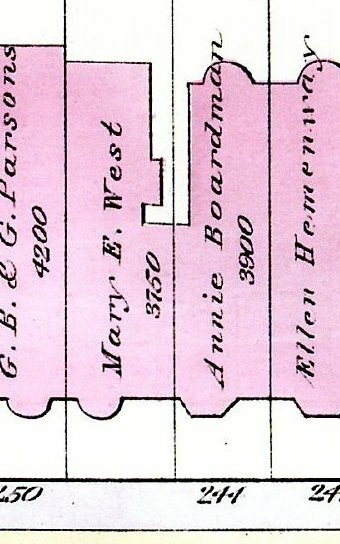 In the late 1890s, they lived elsewhere, probably in Manchester where Annie Boardman died in July of 1899. During the 1897-1898 winter season, 244 Beacon was the home of Amy Gore (Walker) Iasigi, the widow of Oscar Iasigi. Oscar Iasigi had been treasurer of the Vassalboro Woolen Mills and had served as Consul General for the Ottoman Empire in Boston; he was killed in the wreck of the steamer City of Columbus in 1884. She previously had lived at 129 Marlborough. She traveled abroad during the next season, and by the 1899-1900 season was living at 170 Beacon. During the 1898-1899 winter season, 244 Beacon was the home of Mary Frances (Clark) Hoppin, the widow of Dr. Courtland Hoppin, a physician in Providence, and their son, Joseph Clark Hoppin, an archeologist. By the 1899-1900 winter season, T. Dennie Boardman and his children – Madeline and Reginald – were living at 244 Beacon once again. Madeline Boardman married in April of 1904 to John Wallace Goodrich. He was a musician and later would become Dean of Faculty and then Director of the New England Conservatory of Music. After their marriage, they lived at 244 Beacon with her father and brother. 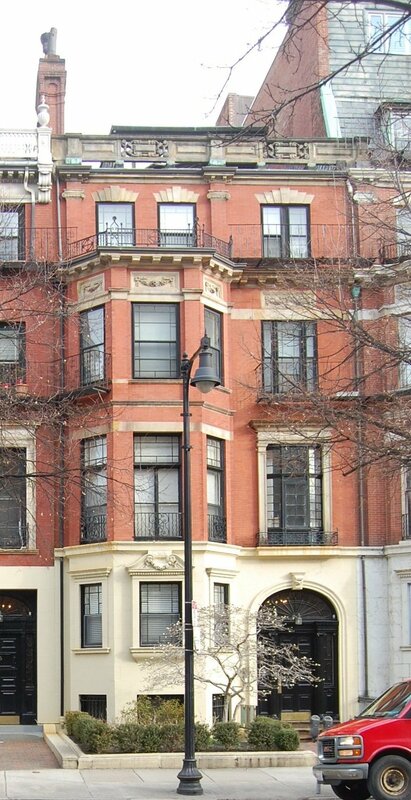 They all continued to live at 244 Beacon during the 1907-1908 winter season, after which they moved to 145 Beacon. On April 14, 1908, 244 Beacon was purchased by attorney Charles Pelham Curtis, III. He and his wife, Ellen (Anderson) Curtis, made it their home. They previously had lived at 40 Fairfield. 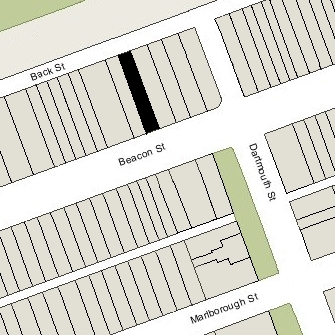 On September 7, 1927, Charles and Ellen Curtis joined with their neighbors at 236-242 Beacon and 246 Beacon in an agreement prohibiting for ten years (until January 1, 1938) any new building or structure behind their houses any taller than 26½ feet. At some point prior to the early 1940s — and probably during the Curtises’ ownership — a penthouse was added to the house. Charles Curtis died in April of 1948 and Ellen Curtis moved soon thereafter. On August 8, 1949, 244 Beacon was acquired by Dr. Howard Cartnick Reith and his wife, Frances Ellen (born Frances Eleanor Lillian) (Gardner) Reith. He was a dentist and maintained his office at 370 Commonwealth; they lived in Winthrop. In July of 1949, before taking title to the property, Howard Reith applied for (and subsequently received) permission to convert 244 Beacon from a single-family dwelling into twelve apartments. In November of 1953, the Reiths acquired 246 Beacon. On July 1, 1971, the Elden Corporation purchased 244 Beacon and 246 Beacon from the Reith Realty Corporation. On February 13, 1979, Charles C. Smith, Jr., and William A. Ryan, trustees of the 246 Beacon Street Associates Trust, purchased 244 Beacon and 246 Beacon from the Elden Corporation. 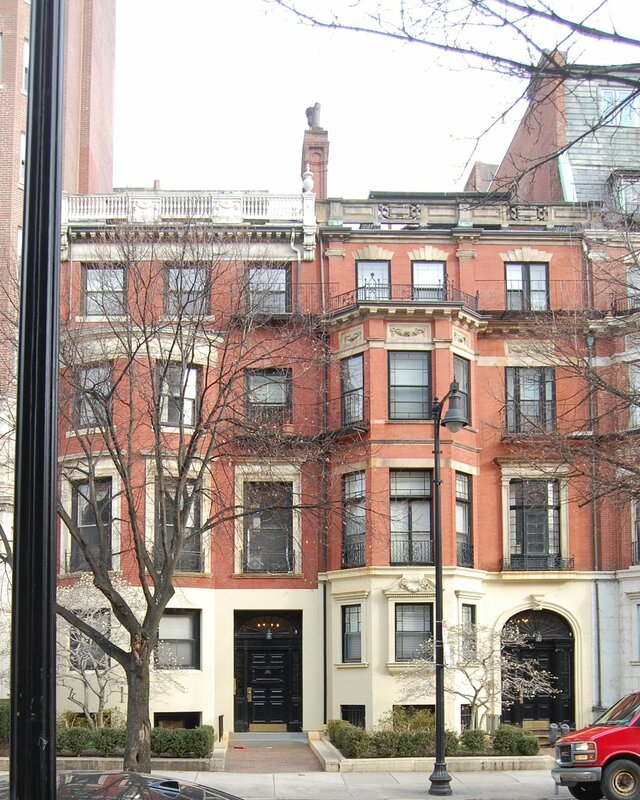 On November 15, 1979, they converted the property into twenty condominium units, ten at 244 Beacon and ten at 246 Beacon, the 244-246 Beacon Street Condominium. In December of 1979, the 246 Beacon Street Associates Trust applied for (and subsequently received) permission to construct a penthouse at 244 Beacon, increasing the number of units to twelve.